Spacious, comfortable, plenty of storage, queen-sized beds, residential fridge, kitchen island; everything that you’ve been looking for in an RV, and all of it can be found in the Jayco Eagle HT fifth wheels for sale, the industry-leading towable in both function and fashion. There are many outstanding features on the Eagle HT fifth wheels that all come in one easy-to-tow fifth wheel. Though there are a ton of amenities to get excited about, here are just four of them to give you a taste of what is waiting for you in this amazing fifth wheels. The Jayco Eagle HT Fifth Wheel is both beautiful and versatile. The Jayco Eagle HT fifth wheel floorplans here at Fretz RV, all come with numerous slideout options that provide more interior space for you and your family to enjoy. When you get to your favorite location, just hit the button to expand your slides and your interior space will grow exponentially! 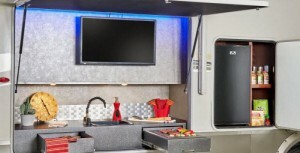 Check out the spacious Jayco Eagle HT fifth wheel interior. So, you don’t want to worry about being in a cramped kitchen when you are trying to cook for the family? 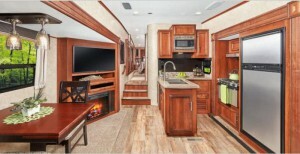 No worries here; the kitchen of the Eagle HT 5th wheel is huge with counter space and storage to spare. A kitchen island gives you additional counter space, and the residential fridge means you can bring as much food as you’d like on the road. Multiple couches and chairs wait for you in the living room, all snuggled around an electric fireplace and a television so that you can enjoy all of your favorite shows and movies on the road. Even more function on the outside — check out the Jayco Eagle HT Exterior Kitchen. That’s not just figurative! The master bedroom of the Eagle HT comes equipped with royal-sized amenities, including queen-sized beds for you to really stretch out on. Plenty of closet space and easy access to the bathroom makes this a truly remarkable on-the-go bedroom. All of this on top of our 2-year warranty means that your Eagle HT 5th wheel is more than just comfortable, it is reliable as well. We are proud to give our endorsement to wonderful Jayco models for sale like this one, so come on down and check out the Eagle HT for yourself and let us show you why it is one of the industry’s leading 5h wheels on the market.